A bird bath placed near a tree or shrub attracts a variety of birds to a yard. Make a homemade bird bath from simple materials assembled in minutes, or create a structure from more elaborate items that add color and beauty to the landscape. The materials to choose from are limited only by the creator's imagination. 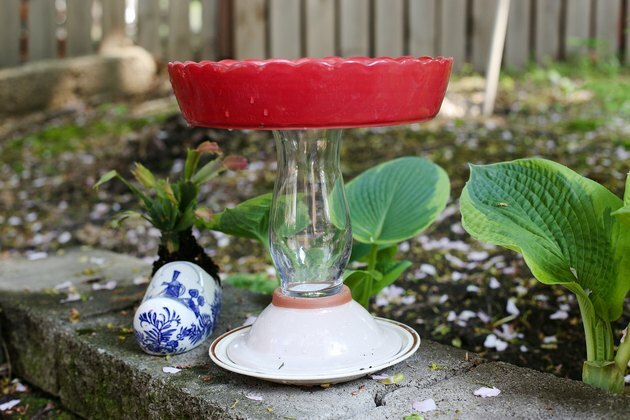 Use recycled items from around the house to create bird baths. Terra cotta pots and saucers come in a wealth of sizes. Effective designs incorporate sturdy materials to provide a stable pedestal base as well as a saucer for the water made of nonslip material so birds won't injure themselves. The saucer should also have a rim for a perch and sides that slope gently toward the center to create shallow areas for bathing, no more than 2 inches deep to eliminate the possibility of drowning. 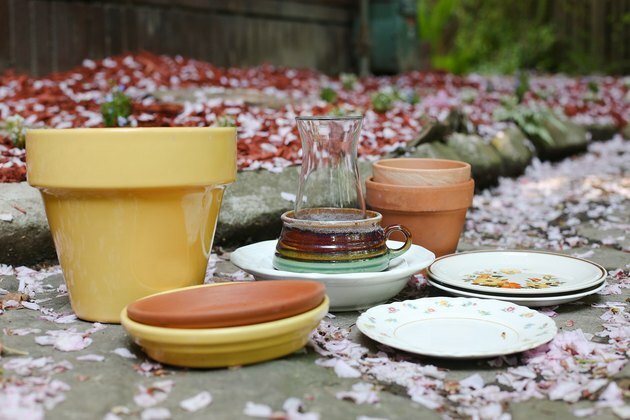 Some materials to try are terra cotta flower pots and saucers, or plastic flower pots with saucers that have rough surfaces. Old glass dishes with rough surfaces also work well and come in an array of colors. This project takes minutes to complete. 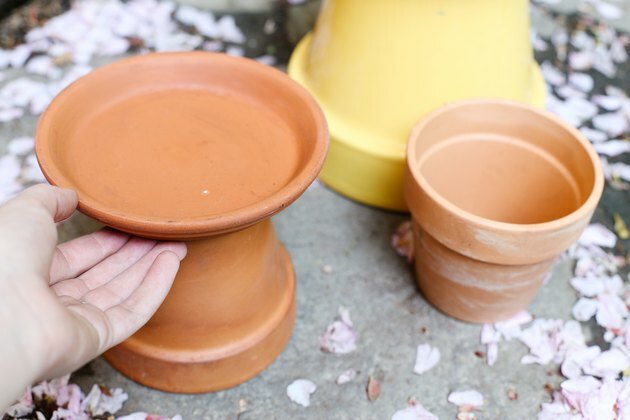 For a simple bird bath created with flower pots, invert a pot on a level area in the yard or garden. Place a matching saucer, facing up, on top of the inverted pot. Size the saucer to the flower pot. For instance, use a 20-inch saucer with a 20-inch pot. Hold the saucer in place by filling it with 1 to 2 inches of water and placing a large, decorative rock or brick in the center. The brick will also double as a place for birds to perch. Choose colorful glassware to compliment your outdoor space. 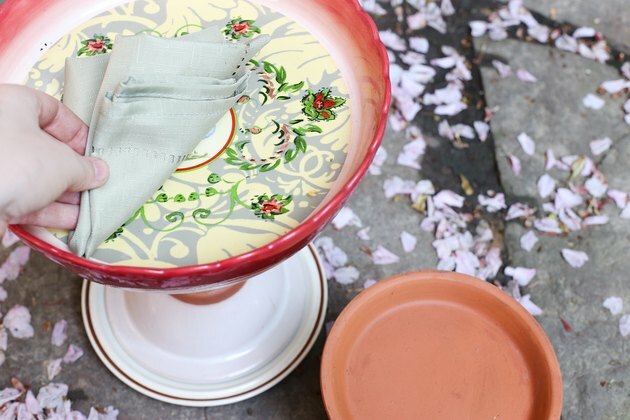 Colored dishes found at flea markets or estates sales add whimsy when turned into artful bird baths. Choose colors that coordinate with the landscape. Assemble the pedestal with wide pieces at the bottom, tapering to a narrow top that supports a serving tray that holds the water. 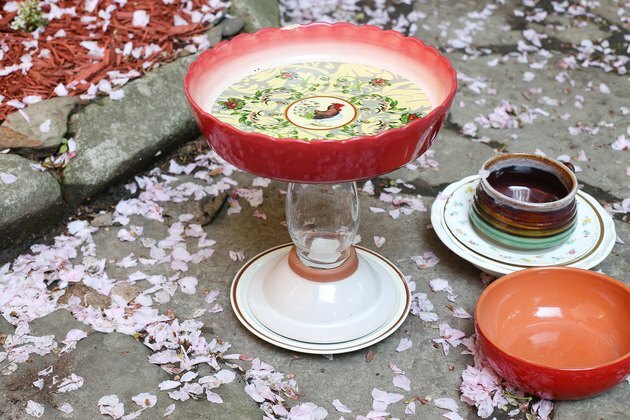 One pattern for erecting a glass dish bird bath is to place a 10-inch dinner plate on the ground, then invert a 9-inch salad bowl on top of it. Place a 9-inch dinner plate upright on top of the bowl, then invert a flower vase with a 7- to 8-inch mouth on top of the 9-inch plate. Finish the bath by placing a serving tray, 18 to 20 inches in diameter, on top of the flower vase base. Trays with hollow pedestal bases work well because they can fit over the base of the flower vase for added security. Bond the glassware together with aquarium glue, which won't crack when wet. Make a smooth serving tray nonslip by spreading a thin layer of pebbles on the bottom for birds to hop on. Glass bird baths should be stored indoors during freezing temperatures to prevent breakage. Keep the birds happy and healthy by cleaning the bird bath on a regular basis. Once you have assembled the birth bath, keep it filled with fresh water and clean it periodically to prevent spreading disease among birds. Placing it in a shady area can help reduce the growth of algae. Once a week clean the bird bath by dumping the water and refilling it with one part distilled white vinegar to nine parts water. Scrub away debris and algae with a stiff brush, but wear rubber gloves while doing so to avoid contact with bird droppings. After cleaning the bath with the vinegar solution, rinse it thoroughly with a garden hose and refill with no more than 1 to 2 inches of fresh water.